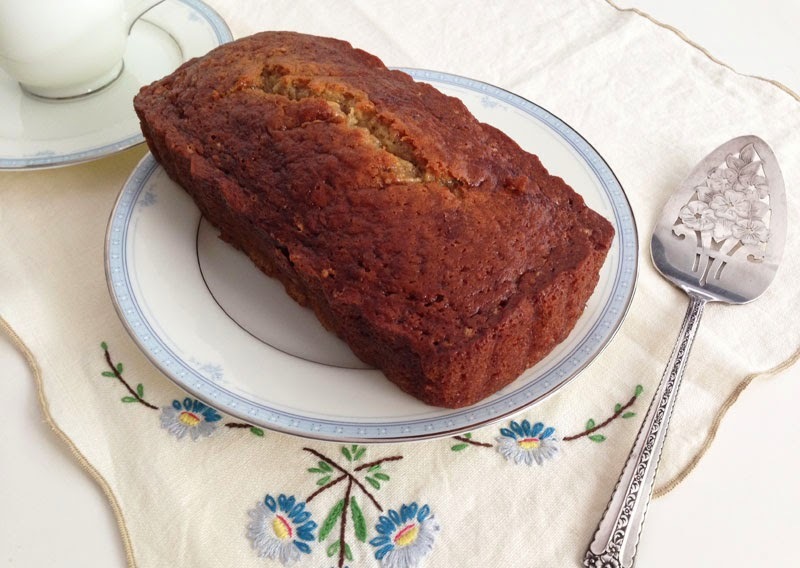 I had three very ripe bananas in my pantry this weekend and decided to tweak my Pumpkin Bread recipe to create a fall version of Banana Bread. I kept thinking of banana pancakes when maple syrup came to mind. Ahhh, bananas and maple syrup - had to try this combination in my bread recipe! Much to my delight, the bread came out great and was super moist. I substituted the applesauce for light sour cream and added vanilla and lemon zest at the end. I find a touch of lemon zest brightens the banana flavor and you can't taste the lemon. Instead of mixing the maple syrup in the batter, I drizzled it on top before baking. The loaves came out a beautiful golden brown. This ones a make again! * A special thank you to my dear 87 year-old friend, Midge, for her hand embroidered linens, china and silver server for my picture. She embroidered these napkins 40 years ago. Whisk or sift together flour, salt, & baking soda in a medium mixing bowl. Set aside. Pour batter into two 8" bread loaf pans coated with canola oil spray; drizzle the top of each loaf with maple syrup. 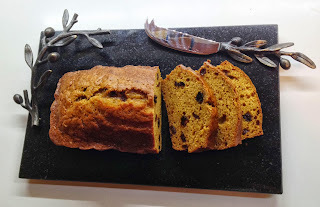 Also, don't miss my Pumpkin Bread recipe from last week!